Hey DIY lovers, are you looking for new DIY projects that you can do in your free time? If you are then you are in the right place for that because we are constantly updating many new ideas, so that you can draw inspiration from. So, here we are today with a collection of several Easy to Make Colored Pencil Crafts that will fascinate you for sure. Confused about what to do with colored pencils? Here are some amazing things to make out of colored pencils. Colored pencils are school supplies and if you have kids you probably have a bunch of them at home. Or even if you don’t have kids, you can get some since they are not expensive at all. 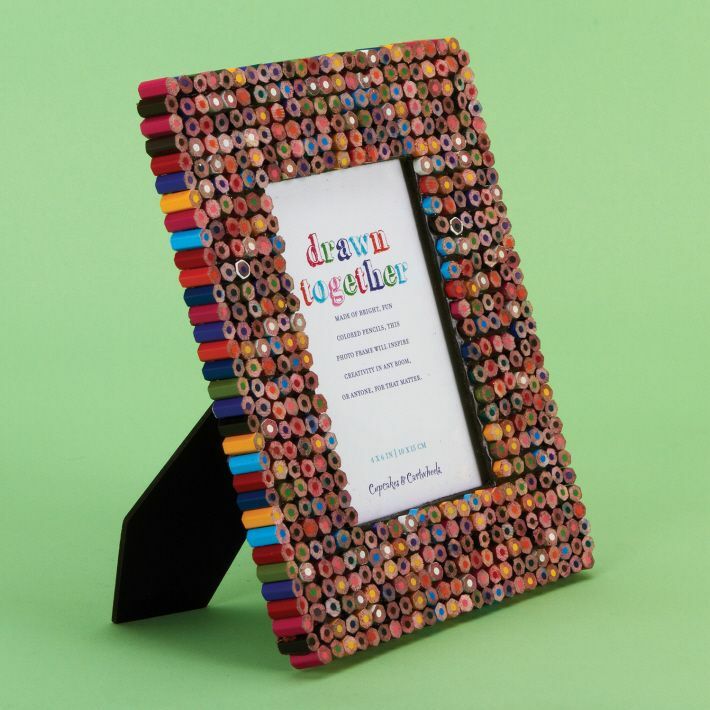 There are versatile items that you can make from colored pencils including picture frames, coasters, vases, pencil cases, some eye-catching wall art and even some unique pieces of jewelry. Below we have included a step-by-step tutorial of how to make some such colored pencil crafts and we hope that you will try to do some of them. As you can notice for some of these projects you will need to cut the pencils into smaller pieces and for others don’t cut them at all. But all in all, these projects are easy to be done and you won’t need any special skills to do them. Check them out and tell us which one of them you will try to do in your free time. Enjoy! For the basic necklace, you will need to begin by making your beads. You can use either hexagonal or round crayons. The beads that were cut were 7mm long. To cut your beads use a small, sharp, hacksaw blade. Take your time when cutting the crayons and try not to apply too much pressure…that way you are less likely to chip the paint off the outside. Don’t worry if the cut surface of your beads looks a bit scruffy…all they need is a quick rub with some sandpaper. You will found it easier to lay the sandpaper on a flat surface and rub the bead along it. Now drill a hole in the side of each bead using a small drill bit. Make sure you place a scrap piece of wood underneath. It’s not a good idea to get holes in the kitchen table! Once you have cut a number of beads simply string them onto a length of thread…job is done! Do try this one of the best-colored pencil craft ideas. Start by cutting these colored pencils. 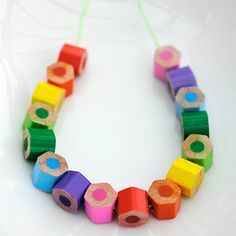 Once all of the colored pencils were cut into small pieces, Use the hot glue gun to secure the pencils onto the cork disk. After the colored pencils were all attached to the DIY coaster, give the top of the coaster a light sanding to smooth out any rough edges. If you want to ensure your DIY coaster gift stays protected from water, finish it off with a coat or two of Mod Podge Outdoor. First off, we need to cut the pencils to smaller ones and sharpen every single piece. Use kitchen knife for the job and it will take time to cut the whole set of pencils and another half an hour to sharpen every piece. Start arranging the little pencils on the frame without using any glue. That way you can always rearrange something you don’t like, swap colors and check if you will need to cut a pencil with an exact length. When you’ve arranged all the little pieces, make sure that the pencil-frame fit perfectly within your plain frame and there aren’t any pencils slipping out. Time for sticking! We don’t recommend instant glue in this case, because it doesn’t give you the freedom to move around the particles after sticking them. Choose a slowly drying glue. Leave the frame aside for an hour or two for the glue to completely dry. Put a favorite picture in the frame and we’re done! Have fun with this little project and be extremely careful when cutting the pencils! Simply cut off a 2-inch length of the pencil (with a sharpened end). Sand down the sawed-off end so it’s smooth. Use a ring pad and curve it with needle nose pliers, creating the perfect setting for your pencil. Use a multipurpose adhesive to glue, and you’re all set! We hope and wish these crafts with old colored pencils will be amazing for you to try. Do try these amazing and simple to try crafts using old colored pencils. Share your works with us.